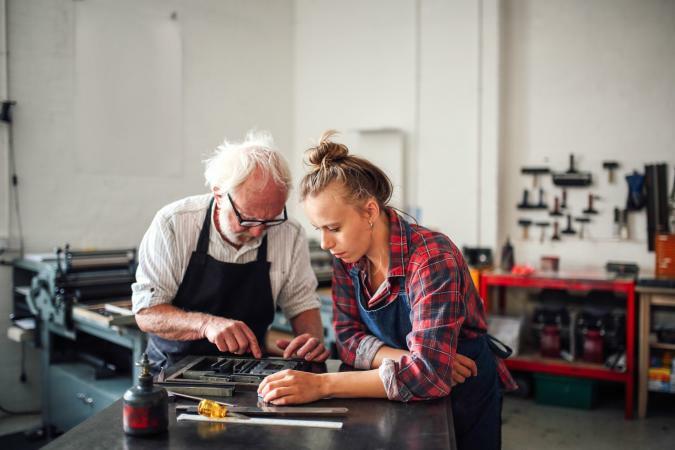 While most of the jobs working with elderly people do involve caregiving and some physical labor, there are a number of other positions available where someone can make use of special skills. If you're interested in working with seniors and can't find the job you think suits you best, try creating it yourself. The demand for variety and innovation in the area of senior care is enormous and growing, so now is a good time to start exploring options. Working jobs with elderly adults who need assistance doesn't always mean pushing wheelchairs and spoon-feeding. Plenty of older people just need another pair of hands around to do some basic household tasks. Even if they are in an assisted living facility, they may still have the need for someone with some specialized skills on a day-to-day basis, and this can prove to be a rewarding experience for everyone. For example, if you're interested in film history and live in southern California, there may be an opportunity for you at the Motion Picture and Television Fund retirement home and health centers. Known by the fond moniker "The Old Actor's Home," the MPTF actually serves as a living center for retired members of the film and TV community in any capacity - writers, cinematographers, stunt people, etc. The MPTF assists with home care referrals as well, so you can get a job assisting someone who was a pioneer in the field in which you're interested. There may be many things they need which can be interesting and exciting, such as organizing archives and interviewing and taking notes to compile for memoirs. Some people are still working and need a hands-on assistant to manage things around the house but also to work with projects. You can feel good about what you're doing and gain valuable career experience at the same time. Other arts organizations have elder care centers, so it's worth looking into what might be available in your area. Particularly helpful for seniors with dementia, art therapy helps seniors express their emotions and have an outlet for their creativity. An art therapist guides clients through various mediums including - but not limited to - drawing, painting, sculpting, and coloring. Becoming an art therapist takes a good amount of schooling; a master's degree is required as well as additional certification. Some states require a license before allowing a therapist to practice as an art therapist. Dance fitness instructor must know how to modify workouts for a senior population, making the routine low or no impact to protect participants' joints. Popular dance fitness brands like Zumba offer versions that cater to an older group. 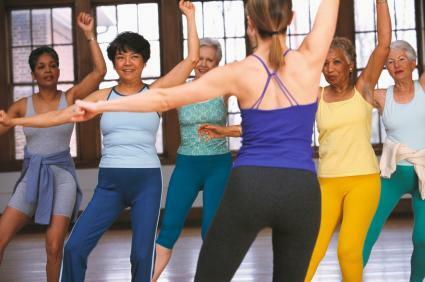 Becoming a dance fitness instructor for seniors requires a brand-specific license or certification and CPR certification. Some organizations require a national group fitness certification like AFAA or ACE. Adult education programs continue to grow exponentially. Many Baby Boomers and older seniors never had the time or the wherewithal to pursue higher education and are doing so now. You don't have to be a professor to have something to offer. Adult education classes comprise almost anything imaginable and are often taught at high schools or community centers. This can be a very rewarding way to gain teaching experience and give of yourself to a receptive audience. Teachers are always being sought for art, writing, yoga, sewing, finance, swimming, and other such activities. But if you have a skill that isn't being addressed and think you are a good resource, go ahead and suggest it! Anything from ceramics to plumbing to philosophy might be of interest, and just the course a group of active seniors in your area has been hungry to take. Acting isn't only for young people - many senior centers and retirement homes offer acting classes for seniors who want the opportunity to explore their creativity while building confidence. Acting lessons can also help seniors better develop their communication skills and engage with other people. An acting coach specializing in seniors should not only have credible acting experience but also familiarity in working with a senior population. A tour guide specializing in a senior population will understand the potential physical limitations (no difficult hiking or non-air conditioned transportation for these folks) of this group and also understand the types of things seniors want to see (probably not a loud dance club with flashing lights). Travel can be an incredibly creative venture - especially with tour guides who know where all the hidden gems of a place are located. Requirements for this type of job vary by employer but a good knowledge of culture and destinations is a must. If you're not a professional nurse, your best bet for finding a job as a caregiver is using a site such as Career Builder or Craig's List. When looking for something more dependable, go directly to sources like senior living facilities or community centers staffed with people who can advise you on your skills and interests and how they might best be applied. Don't wait for the perfect job to come up - seek it out! Post information about yourself at senior and other community care centers, showing off your niche market. If you read the book In Her Shoes, you'll remember the character who started a successful business as a personal clothes shopper for seniors who still wanted to dress well. If you sew, you could start a cottage industry making stylish dresses for the senior set. You could be a movie companion, a dog-walker, a personal chef, an exercise trainer, or anything else that you know you can do well but someone may not realize they want or need.